Macan Wilson runs with the ball. The senior receiver caught five passes for 107 yards against Nebraska. LINCOLN, Neb. — Northwestern had the overtime magic two weeks ago, when Iowa tight end Noah Fant dropped an open pass to give the Wildcats a 17-10 win. NU had the magic last week, when junior linebacker Nate Hall picked off Michigan State quarterback Brian Lewerke to give the Cats a 39-31 victory in triple overtime. And NU had the magic again amid a wash of scarlet Saturday, as senior safety Kyle Queiro deflected a Tanner Lee pass to secure a 31-24 overtime triumph over Nebraska, giving the Cats (6-3, 4-2 Big Ten) their fourth-straight win and an FBS-first third consecutive overtime victory. 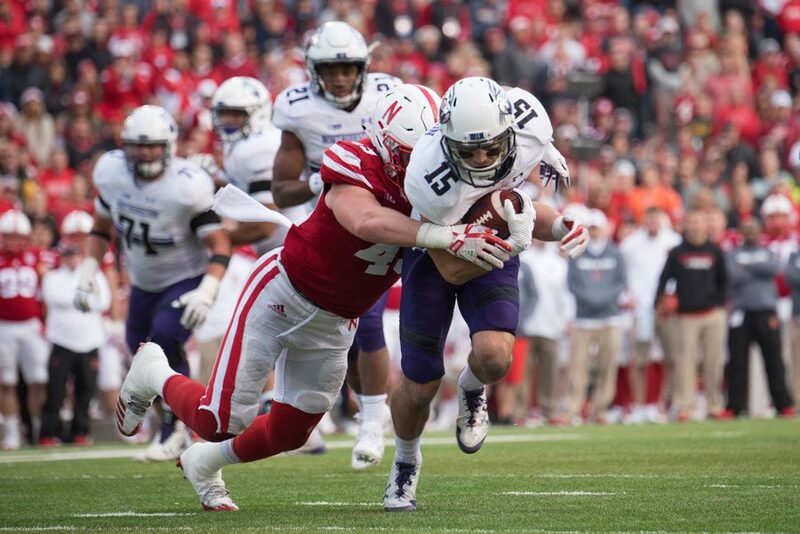 The overtime stop came after junior quarterback Clayton Thorson nudged the ball across the goal line on fourth down to give NU the lead, setting the stage for the Cornhuskers’ (4-5, 3-3) four-and-out to end the game. It was a satisfying ending to an uneven day for Thorson, who completed 19-of-35 passes for 243 yards and threw two interceptions. He gathered himself late in the fourth quarter, leading the Cats on a 13-play, 84-yard drive that tied the game with 5:03 remaining. After senior safety Godwin Igwebuike intercepted Lee deep in NU territory, Thorson completed three passes of 10-plus yards on the drive and capped it with a seven-yard scramble into the end zone. “Huge plays by those guys — kept us in the game,” said Thorson, adding that he improved markedly on that drive. The second half had otherwise been a nightmare for Thorson. His first post-halftime pass was intercepted by Marcus Newby and returned for a touchdown, giving Nebraska its first lead of the afternoon. The Cats then punted on three consecutive series, hampered by an errant quarterback who completed just three passes and badly missed a variety of throws. NU’s defense, however, bailed out the offense. Leading by 4, Nebraska moved the ball methodically down the field, eating up nearly 10 minutes of third quarter game time on 18 plays. But the Cats kept the Cornhuskers out of the end zone — a “critical turning point,” Fitzgerald said — and forced a short field goal that kept the game within one score. Queiro was the defensive standout, intercepting Lee twice and breaking up three more passes. He shined in the game’s key moments, nearly grabbing a third interception on a pivotal Nebraska third down in the final minute of regulation, then batting away Lee’s last-ditch pass on the game’s final play. A climactic finish looked unlikely early in the game, when senior running back Justin Jackson — who rolled up 154 yards on 31 carries — juked his way into the end zone on NU’s first possession, and Queiro quickly followed with his first interception. But Thorson was then intercepted himself, setting up a back-and-forth first half that gave way to a third quarter controlled by the Cornhuskers. The Cats responded late in the fourth quarter, then executed brilliantly in the extra session. NU made just enough plays offensively to score, then pushed Nebraska backward on its series, sending the Cats to bowl eligibility and most of the 89,721 fans at Memorial Stadium home disappointed.